Practical tools and advice to save preschool and primary school parents time, energy, money and, most importantly – their sanity! Prepare yourself and your family for going back-to-school. This book is dedicated to today’s time-starved, busy parents – that’s most of you! You are raising your children with less time and energy than any previous generation of parents ever has, but your parenting role is just as big and important, if not more so, than it ever was. It is filled with practical tools and advice to help prepare yourself and your family for going back-to-school. 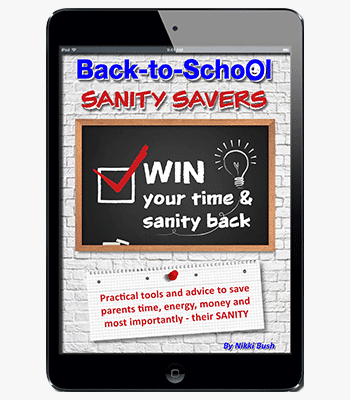 The title of this e-book is Back-to-School Sanity Savers because the beginning of every year and, indeed, every term, is fraught with the stress that comes with change, adjustments and getting back into the groove. Personal organisation and being prepared, are the keys to handling new beginnings smoothly and with less stress – for both you and your children. This quick-to-read guide is meant to save you time, energy, money and lower your stress levels. I have included my top 12 sanity savers as well as links to download helpful checklists, templates, exclusive short podcasts, TV interviews and other creative and useful tools to get your family back on track. I know what it’s like in the trenches of parenthood, I’m there too. And of course, just as you find your rhythm with the term, either mid-term break or the school holidays will disrupt you. Arrive back at school and the sports and extra-curricular timetable will have a seasonal change, or your child’s teacher will go on maternity leave, and you are back to where you started! Having to find a new groove again. I have also included some 21st century parenting wisdom to challenge your approach to the year, the term and even your parenting style. I want you to get the best out of your parenting journey with as little stress as possible; make fabulous memories with your children every day, and remember that parenting is as much about you as it is about your children. I hope you will revisit this e-book over and over again. The downloadable items will always be available for you to repeatedly print off new checklists, weekly planners, media schedules and more.